and this is one of my so called "practice artwork". Let's take a look at the cozy environment! They do serve alcohol too! Celebrating in a high rise FINE DINE restaurant makes me excited! Great dining place for any occasion! Nice high rise view from Tanzini! Even looks better for the night view! The "Hall of FAME" along the walkway!!! It's kinda hungry while writing this food review! having their chef tailor made the birthday menu for me! They serve us soft bread before our 4 course meals started! with the fresh Roma Tomato was AWESOMEEE!! Fusion Cream Mix Mushroom Soup that SOO RICHH with mushroom mash!!! Poached Red Lobster from Canada in White Wine serve with Dill Reduction. The meat of the poached red lobster is juicy and I can feel the freshness of it! Classic Italian Dessert that melts right into your mouth with the combination of cakes + cream+ fresh strawberries slices! Mr Mars do prepare ice-cream cake for me as well! Thanks for the arrangement and the balloons Mr Mars! make sure you made your booking at least 1 week ago with Tanzini! make sure you make your reservation at least 2 weeks ago! Trust me, the restaurant usually fully booked during those dates! Address: G Tower, 199, Jalan Tun Razak. 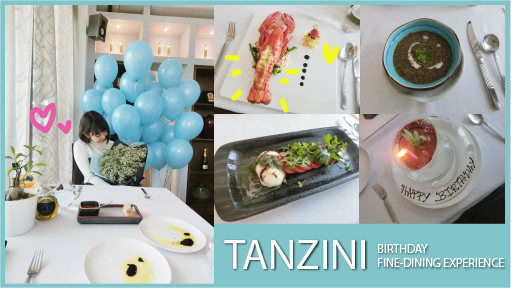 Thanks Tanzini again for the great arrangement and five star services! Glad to know about this birthday party. Couple of months ago, I arranged my cousin’s birthday by booking one of graceful Venues in San Francisco. Arranged a lovely party there for her and we all enjoyed it a lot.